He’s not following the TB12 method to the letter, per se, but Vikings quarterback Kirk Cousins has become a devotee of some of the health concepts Patriots quarterback Tom Brady has credited with helping him play into his 40s. 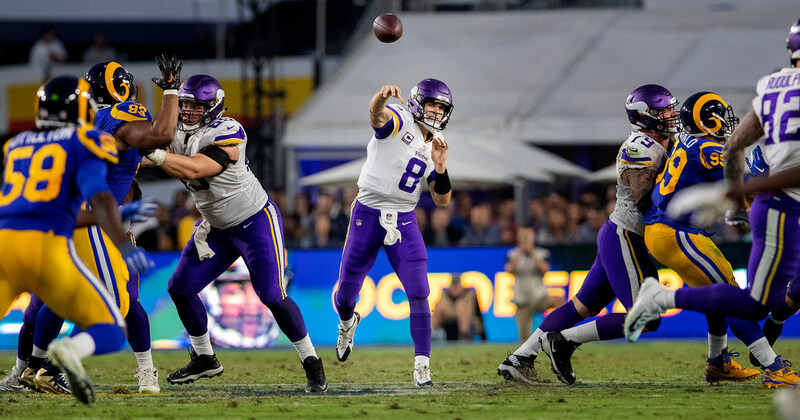 Cousins, like Brady, Saints quarterback Drew Brees and Packers quarterback Aaron Rodgers, is on a strict health regimen that cuts out products like wheat, dairy and eggs. The fitness plan he’s developed with trainer Joe Tofferi is focused on helping Cousins keep his muscles long and limber, rather than trying to put on weight. The quarterback’s plan might not be quite as strict as Brady’s — Cousins has talked about his cheat days at places like Shake Shack, Portillo’s and the State Fair — but he’s among the quarterbacks who believe one of the keys to a longer career is a more detailed diet. “A lot of what he’s doing, or what I’ve learned about what he’s doing, I had actually — with different people that I run into — saw the same messaging, in terms of what to eat, what not to eat, the importance of sleep, the importance of [soft] tissue work,” Cousins said. “Everybody I was seeing was really reiterating the same things, so when you see it coming from one of the greatest quarterbacks of all time, you see it coming from the people you work with, you say, ‘Maybe there’s something to this.’ I think it affirmed some of those approaches. 2. With both Xavier Rhodes and Mackensie Alexander questionable for Sunday’s game, the Vikings could turn to Holton Hill in a bigger role on Sunday. Indications at the end of the week were that Hill would likely start in the Vikings’ base defense if Rhodes isn’t able to play with a right hamstring injury; Rhodes practiced for the first time all week on Friday, and said he got a “couple plays,” and did enough to help him be more confident about the possibility of playing on Sunday. If Rhodes is cleared after a pre-game workout, I’ll be curious to see how much he’s able to open things up, and if the injury has any effect on the rest of his kinetic chain. From what I’ve heard this week, while the Vikings avoided the worst- case scenarios with Rhodes’ injury, his hamstring injury is still significant enough that it’s not as though he’d be playing completely free. If he does play — and given the significance of the game, the Vikings could certainly pursue the possibility — it will be interesting to see how effective Rhodes can be. 3. The Patriots ran the ball for 215 yards against the Jets last week, and if they pursue a similar plan against the Vikings, they’ll pit one of their strengths against the NFL’s fourth-best run defense. ESPN’s NFL Matchup — which might be the best Xs and Os show on television — does the football public the favor of tweeting out some of its film breakdown clips, given how early the show airs on Saturday and Sunday mornings. Here, Greg Cosell offered an insightful breakdown of the Patriots’ run scheme and how they’ll use ’21’ personnel (two running backs, one tight end, two wide receivers) to try and run the ball against the Vikings. Fullback James Develin could be an important piece for New England on Sunday as the Patriots try to handle the Vikings’ run front. 4. Former Vikings defensive line coach Brendan Daly, who first worked with the team under Brad Childress and then again under Leslie Frazier, is in his fifth season with the Patriots and his fourth as the team’s defensive line coach. Daly interviewed with Zimmer for a chance to stay on the Vikings’ staff before Zimmer brought in Andre Patterson; since Daly has been in New England, he’s won two championship rings and coached in three Super Bowls. 5. Sunday will be just the 13th time the Vikings and Patriots have met, but as infrequently as the two teams have played, they’ve managed to spread their meetings out across six different stadiums. They played for the first time at Harvard Stadium on Dec. 13, 1970, and met four times at Foxboro Stadium (called Schaefer Stadium when the two teams played there for the first time in 1979). In Minneapolis, the Patriots managed to catch the Vikings in each of their first three homes — Metropolitan Stadium, the Metrodome and TCF Bank Stadium — playing their most recent game against the Vikings in Week 2 of the 2014 season, in what turned out to be the first of 15 games Adrian Peterson would miss following his indictment on child abuse charges. In the 1994 meeting between the two teams, Drew Bledsoe set a NFL record with 70 pass attempts, as the Patriots rallied from a 20-0 deficit to beat the Vikings at Foxboro Stadium. The Vikings’ last win against the Patriots actually came in Bill Belichick’s first year as the head coach in New England, where the Vikings beat the Patriots 21-13 in Week 2 of the 2000 season. It was the first time Randy Moss and Belichick would share a stadium for a Vikings-Patriots game; the last time, of course, came on Halloween 2010, when Moss criticized Childress by way of praising Belichick in his post-game press conference, weeks after being traded back to Minnesota from New England. Childress, of course, told players the next day that Moss would be released, which he was the following day. When the Vikings and Patriots meet next at U.S. Bank Stadium in 2022, the regular-season series will have its seventh venue in 14 meetings. The Patriots, of course, already played at U.S. Bank Stadium in Super Bowl LII, occupying the Vikings’ home locker room in February. The teams also played an exhibition game in 1971 at Memorial Stadium, in a matchup that helped raise money for U of M scholarships. 6. Vikings offensive coordinator John DeFilippo, who at age 40 a year younger than Brady, marveled this week at Brady’s longevity, given how he’s noticed his own body starting to ache when he wakes up in the morning. There’ll be plenty of Big Ten connections for the quarterbacks on both sidelines Sunday; in addition to Hoyer and Cousins, Brady went to Michigan and Vikings backup Trevor Siemian went to Northwestern. 8. In many respects — with championships, of course, being the most significant exception — the Vikings’ resume since the 1970 AFL-NFL merger is actually comparable to the Patriots’ body of work. Minnesota has won 424 games since the merger, sixth in the NFL and only 10 behind the Patriots’ 434 for fifth place. The Vikings’ 27 playoff berths are the third-most in that time, three ahead of the Patriots (who are tied with San Francisco at 24), and Minnesota’s 18 division titles is the fifth-most in the NFL, just one behind New England, which shares second place with Pittsburgh and San Francisco. 10. ESPN’s Mike Reiss – – from whom the inspiration for this Sunday notes column was drawn — has an item in his piece this morning about the bond between Adam Thielen and Cordarrelle Patterson, dating to when the two were rookies (Patterson a first-round pick, Thielen an undrafted free agent) in Minnesota. When the Star Tribune hosted Thielen for a Q&A with high school athletes before his keynote address at our inaugural All-Metro Sports Awards at Target Field this summer, I asked Thielen about the teammates who would surprise you with how much they’d had to overcome in life. The first name he brought up was Patterson. The former roommates have remained close, and their somewhat unlikely friendship is one of the examples of what I think is a pretty cool element of NFL culture.